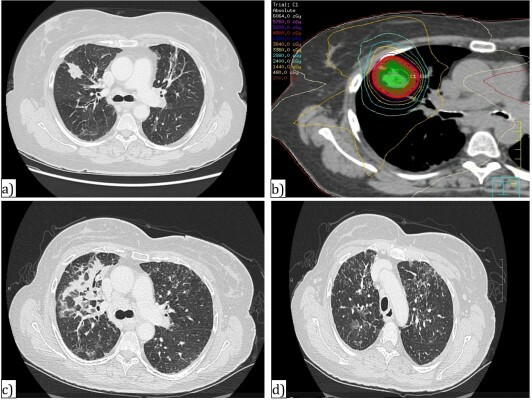 Abstract: Stereotactic body radiation therapy (SBRT) has emerged as a new technology in radiotherapy delivery, allowing for potentially curative treatment in many patients previously felt not to be candidates for radical surgical resection of stage I non-small-cell lung cancer (NSCLC). Several studies have demonstrated very high local control rates using SBRT, and more recent data have suggested overall survival may approach that of surgery in operable patients. However, SBRT is not without unique toxicities, and the balance of toxicity, and effect on patient-reported quality of life need to be considered with respect to oncologic outcomes. We therefore aim to review SBRT in the context of important patient-related factors, including quality of life in several domains (and in comparison to other therapies such as conventional radiation, surgery, or no treatment). We will also describe scenarios in which SBRT may be reasonably offered (i.e. elderly patients and those with severe COPD), and where it may need to be approached with some caution due to increased risks of toxicity (i.e. tumor location, patients with interstitial lung disease). In total, we hope to characterize the physical, emotional, and functional consequences of SBRT, in relation to other management strategies, in order to aid the clinician in deciding whether SBRT is the optimal treatment choice for each patient with early stage NSCLC.